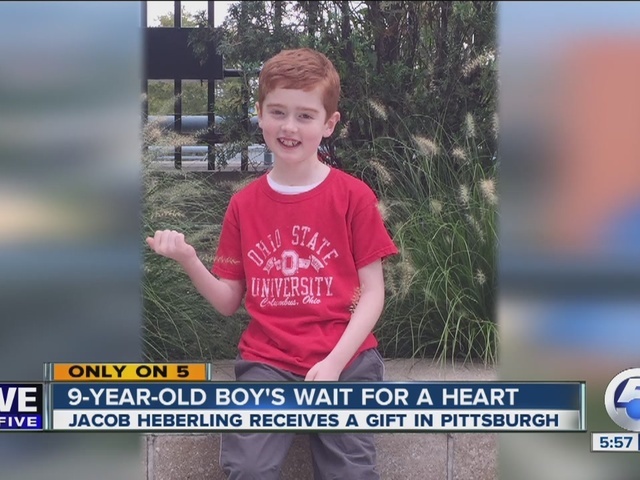 Amy Maple, Jacob Heberling's grandmother, has patiently waited in Parma Heights since the early hours of August 29th when her grandson was rushed by his parents to a Pittsburgh hospital for heart surgery. The trip to Pittsburgh had become familiar for Jacob's father, Martin Heberling, his wife Kyle Heberling, and Jacob. Specialists there had been keeping a close eye on Jacob's condition multiple times all summer after he had been on a heart donor transplant recipient list since June. Jacob had fallen on the floor of the family home May 31 in the bathroom after everyone had gone to sleep. Startled by a loud sound later that night, Martin had found Jacob with half of his body unresponsive. Calling 911, an emergency ambulance ride to a nearby hospital, the family eventually ended up in the early morning hours at University Hospitals Rainbow Babies & Children's Hospital. Jacob had suffered a stroke. Doctors determined it had been caused by restrictive cardiomyopathy. The family was told by his doctors that his need for a new heart was immediate. After an urgent late-evening hospital call Aug. 28, 2 a.m., Aug. 29 would soon become a time the family will look back on with an array of emotions: It was time for Jacob's heart transplant surgery. Another family had to lose a loved one for Jacob to receive his life-saving heart. The Heberlings told me they're heart and prayers goes out to them. A perfect match, Jacob's new heart has been accepted by his body without issue. Within days he could be seen on his parent's cell phone video, saying, "Two days. It's amazing." This week Jacob got to walk outside in the courtyard of the Ronald McDonald House in Pittsburgh. Pictures of Jacob in a red and white Ohio State Buckeyes shirt with a smile as wide as all three rivers there tells the tale of just how far he's come since the morning he received his heart. A testament to just how much his heart was working well came within two days of his surgery when he showed concern that he had missed buying both of his parent's birthday presents. In of the family videos Jacob's father, Martin, can be seen pointing to his son's new heart behind his hospital gown, telling him, "It's right there, the greatest gift in the world is you. I love you." Jacob is scheduled to be home sometime in October. He will have to be home-schooled at first, but Maple said he can't wait to get home and be what he calls a "normal boy" again. Even when Jacob was waiting for a chance to fight for life with a new heart, he never gave up. Kyle's father Greg and his wife Amy have supported Jacob each day by text, email, FaceTime and cell phone calls from Pittsburgh; just about any form of communication they can. Watching Jacob struggle with his health all summer was tough. "Whenever we saw him he had a smiling face," said Maple. Like a baseball game, or a game of tennis with his dad, Jacob was determined to get his second chance at life with a new heart. "He really did. That's all he wanted and he got it. And we are very happy," added Maple. "His prognosis is he's doing well, and hopefully he'll be coming home soon." Medical bills have been piling up for the Heberlings even before the surgery. There are now a few methods to donate to them if anyone would like to help. Getting Jacob his heart was a hurdle the family has now crossed. It has been draining emotionally and financially. To compound matters, Jacob's mother Kyle was just informed by her employer this week that she is now out of a job. Her vacation time, her family medical leave, her earned and borrowed time off days donated from fellow employees are all exhausted, according to the Heberlings. Finding a job for Kyle after getting Jacob home, well on his way to recovery, will have to wait. To donate to Jacob's medical debt go to: www.gofundme.com/jacobmedical .